Starting university in september & am looking at getting a new PC to join me. Got a budget of about &#163;850, but id like that to include a solid widescreen(20''+) and vista if possible. Using scan iv spec'd out this PC, however it is more of a rough guide of what im after then anything set in stone. i know the basics of the hardware etc, but not a great deal of which component is best in each sector, so any advice & alternatives would be much appriciated! Main uses will be a lot of multi tasking - MSN, web & music near enough all the time, films quite often, then gaming & DVD encoding now and then. I wont be o/c & would like to try and keep costs down(without cutting out performance) wherever possible. - graphics card, might use my old 7900GT for a bit longer & save up for the 8800GTS, is it likely to change in price much? In terms of screens, iv found these 2 which i like. The top one looks nicer, but isnt height adjustable (iv already got a 19inch black sony & would like the 2 screens to suit each other (for want of a better wording). The 2nd is height adjustable, but doesnt look so stylish & doesnt have such a gd contrats ratio - how important is this? Also does anyone have any recommendations case wise? id like something slightly different, but nothing garish. Both the antec 900 & Xclio windtunnel took my fancy, anyone have any experience with either? Last edited by Andeh13; 28-07-2007 at 05:03 PM. Not heard about any upcoming 8800 price drops.... no reason for nvid to drop them at the minute as there is no decent ATi competitor around. Perhaps in november if nvid get their new card out on time, but who knows? Got the Antec 900 and I really like it, good cooling, some think it's a dust trap, but no problems with mine. Only minor issue is that the front panel audio cables only reach the mobo by going pretty much directly there, ie you can't re-route them to hide them because they aren't long enough. Also, the clip on the side panel that holds the optional 120mm fan on doesn't grip the fan tightly, so vibrates like buggery. Tried everything I can think of to solve this prob, but no joy. Other than that no complaints, I like the removable HDD cages, etc. Looks a nice well balanced system. No problems with it at all. As GSte has said not much hope of any price drops atm unless AMD go mad and drop the price of the 2900xt. The new gen card may be out for late Nov/Dec but it may well be out of your price bracket as I suspect they will release the high end card first. 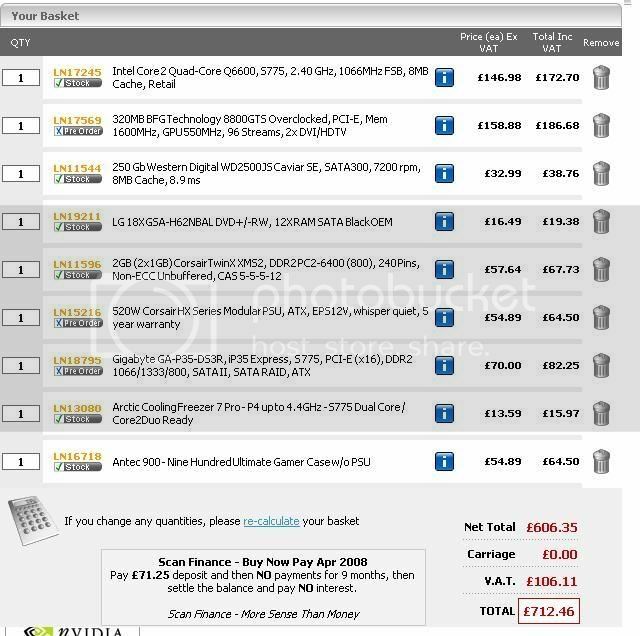 http://www.ebuyer.com/UK/product/125098 that would be my choice higher spec better contrast ratio nad a better panel. Buy 2 DVD RWs ? Thought about it but trying to keep the price down atm, might pick a 2nd one up later on in the year. Not going to order the 8800 for a couple more months, will use a 6600GT then a 7900GT till then, would this cause any problems with Vista when i replaced them with the 8800? Aside from that, all looks good for everyone else? yep, im the same. Already got 1 x 250gb HDD with my films & music ready to put in once its all setup. All sorted, being delivered next week!